The Mint Oreo Blizzard returns to Dairy Queen as the Blizzard of the Month for March 2017. 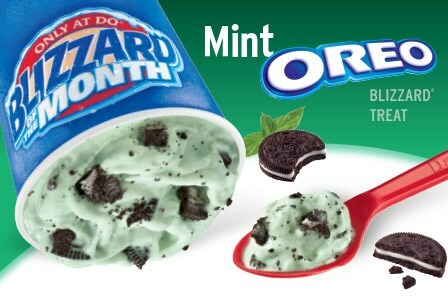 The dessert features Oreo cookies and crème de menthe mint topping blended with Dairy Queen's signature vanilla soft serve. The green-colored Blizzard has been offered several times before as the March Blizzard of the Month to coincide with St. Patrick's Day.